This article will cover the structure and function of the adrenal medulla, which is the central part of the adrenal gland, surrounded by the adrenal cortex. Its main function is to secrete adrenaline and noradrenaline. The adrenal glands, also known as supra-renal glands, are found immediately superior to the kidneys. They are retroperitoneal structures and composed of two major regions: the outer adrenal cortex and the inner adrenal medulla. 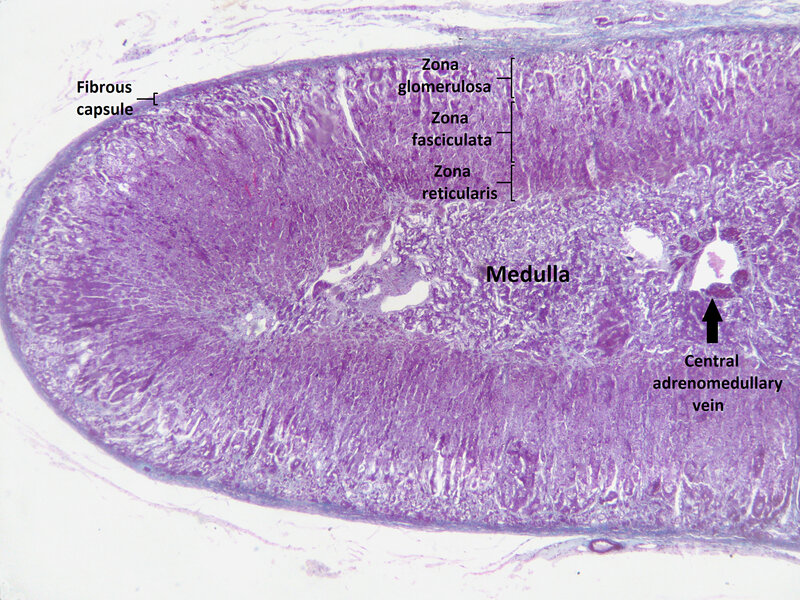 The main secreting cells of the adrenal medulla are called chromaffin cells, which are neuroendocrine cells that are modified sympathetic ganglia. The chromaffin cells are neural crest cell derivatives. Adrenaline is released in response to activation of the sympathetic nervous system, fibres of which are carried to the adrenal medulla by the thoracic splanchnic nerves. The adrenal medulla is mainly responsible for the synthesis of the catecholamines, adrenaline and noradrenaline, but also has other secretory functions such as the production of dopamine. Both adrenaline and noradrenaline are produced from the amino acid tyrosine, through multiple reactions. The synthesised adrenaline is stored in vesicles before being released into the blood stream. Adrenaline is mainly associated with the ‘fight or flight response’, and noradrenaline also plays a role in the activation of the sympathetic nervous system as a neurotransmitter in post-ganglionic synapses. It exhibits its actions through α and β adrenoreceptors (G protein coupled receptors), both in the central nervous system and in the periphery. The ‘fight or flight response’ is a key survival mechanism, and causes a number of physiological changes, such as increased cardiac output and increased glycogenolysis in liver and muscle tissue. In some situations it can lead to a hypertensive crisis. Whilst the above symptoms are all possible, the most typical presentation is intermittent attacks of headaches, excessive sweating and tachycardia. Typically treatment involves surgical resection of the tumour, however alpha adrenoceptor blockers often need to be given prior to surgery to minimize complications of surgery. Fig 3 – Adrenal gland with a phaeochromocytoma present in the medulla. What are the main secretory cells of the adrenal medulla? What is the general mechanism for release of adrenaline from the adrenal medulla? Which of the following is NOT synthesised in the adrenal medulla? Which of the following is a symptom of phaechromocytoma?